Canada's House of Commons agreed this week (something its members don't often do) to create a National Suicide Prevention Strategy. The vote was practically unanimous, I've heard. Everyone agrees that suicide is tragic and heartbreaking. Media pundits believe, however, that talk is cheap and that talking about developing a strategy to prevent suicide is not the same as taking action to prevent suicide. All of this got me thinking about suicide in broader terms, and I wondered (due to our parliament's unanimity) if the idea of global suicide prevention is something people could easily grasp and get behind. The English word "suicide" comes from the Latin sui "of oneself" + caedere "kill." 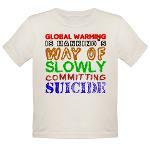 And it is true that we are killing ourselves — certainly our species, our progeny (hence, my coined term "progenycide"), if not our own children or grandchildren. So what would a global suicide prevention strategy look like? Here are my ideas. Please feel free to add your own. Declare the planetary climate change emergency. Immediately switch all subsidies to promote the growth of renewable energy technologies and businesses. Immediately make it law that all businesses must pay for their hitherto externalized social and environmental costs. Immediately create a Global Green Fund with a donation from every nation of 10% of its military budget. Plant trees. Plant trees. Plant trees. Plant trees. Everywhere, everyone, at every level of government. Teach children how to grow food. NOW. Put the children and all future generations of our species at the centre of all our talks, conferences, summits, and negotiations. Create a Global Suicide Prevention support group. This stuff is scary and we need friends and like-hearted community members to help us face all this and work at it. Most of the actions above are not things that individuals will do, but together we can be change the political will of our governments.